While we haven't even thought about beginning to decorate here at the Lindahl home, Nancy and I recently spent part of an evening at another family's home while they decorated for Christmas and trimmed their tree. Nancy is currently writing a series of columns for the newspaper about local chefs and their Christmas dinners at home. So we set out to talk with Craig and Maria from the Red Tavern here in Chico. When we arrived, the family was in the throws of making divinity, a white fudge-like dessert they serve in small balls. It also has almonds in it, I think. It was tasty, but my real focus (quite literally, with my camera lens) soon turned to their Christmas tree, slowly becoming full with ornaments. I love the shot below - Maria decorating "adult" style. Watching another family decorate their Christmas tree was a unique experience for me. I've only ever really put up a Christmas tree with my parents and sister, save the time I did it at UW Credit Union after Thanksgiving. But taking part in a standard Christmas task with another family allowed me to hear about their traditions, the history of their holidays, and to check out their many ornaments. We talked about tree decorating and how my sister and I used to fight to get our baptism ornaments the highest on the tree. So in the spirit of Christmas, I want to hear about your tree decorating experiences, your favorite ornaments or holiday adornments! 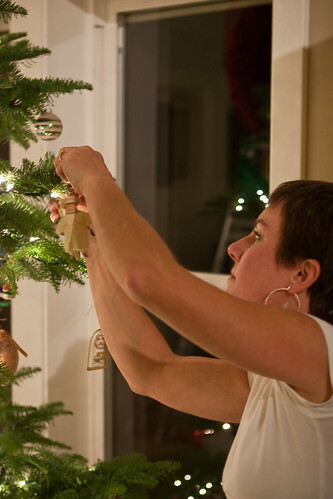 Do you always make eggnog for tree decorating? Who does the majority of the work? Does your mom come down in the middle of the night (Maria's little secret) to adjust all the ornaments and evenly distribute the red ones? our favorite ornaments this year are the new baby ones, including one made by chris's grandma! as you know, we collect ornaments from everywhere we travel. other traditions include drinking bailey's milkshakes to rudolph. wish you were here to join us! What a sweet post! It makes me miss my family so much! Usually this is how it proceeded in my family. Dad got the xmas tree down from the garage attic after dinner one night, usually a week or 2 after thanksgiving. It often times meant moving around the furniture in the living room as well to make room for the tree. We always played classic christmas music - none of this new crap! 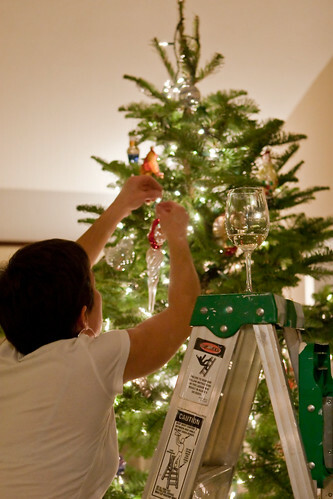 First my mother would struggle with getting the lights untangled, they went on first. My brother and I have an ornamet for each year and generally we each hung our own. 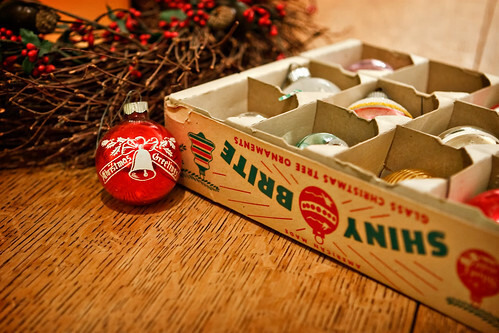 There were always extras that our family had received as gifts too! One of my favorites was a tiny little mouse sleeping in a walnut shell - complete with a pillow and little red and white quilt. "Adult style?" Really, Red? Geez. My sister and I used to fight over who got to put up the "cool" ornaments - clothespin figures my parents made together in the '70s. There was a drummer, a caroler, a skier, a cannoneer . . . you get the idea.